Terex Trucks Motherwell is a global centre of excellence manufacturing a range of rigid haulers with payloads from 32 to 91 tonnes and articulated trucks from 25 to 38 tonnes. Manufacturing here includes fabrication, assembly, painting and quality checks for equipment supplied to the UK and exported to global markets. The site is also home to the main spare parts operation and supplies whole kits to China for a local-market assembly plant. When the need arose to replace an ageing materials handling fleet, the key requirement was to source reliable, comfortable and economical equipment fitted with a fleet-management system able to provide real-time information and reporting. The products manufactured at Motherwell, by their very nature, tend to be large and bulky. Combine this with the fact the site is built on a hill and the main large-parts storage area is at the top of the site, meant a robust, tough counterbalance truck was called for. 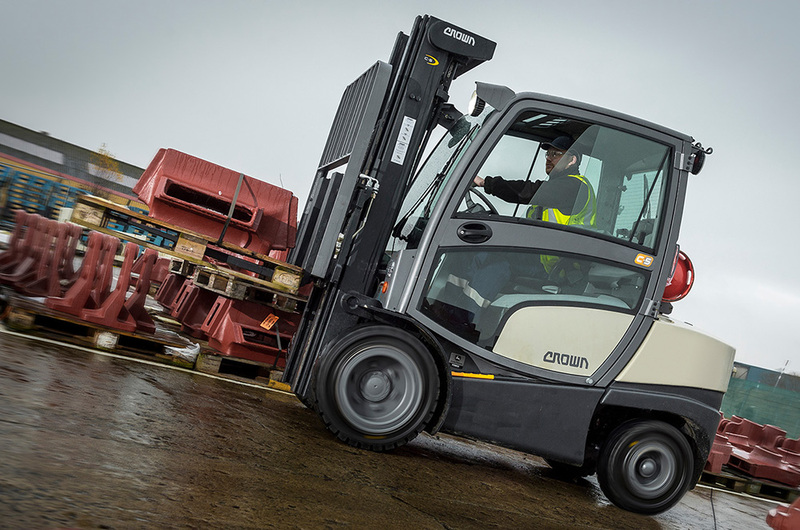 After a competitive tender process, Terex Trucks selected Crown to supply a new materials handling fleet including its new C-5 Series gas forklifts fitted with the proven Crown InfoLink® fleet managemnt system. The Crown C-5, equipped with full cabin and weigh scales, is used to transport wheels, axles and heavy parts from storage, often retrieving items from outside storage areas to feed the production lines. When working inside, feeding the production lines, the C-5 is limited to a maximum speed of five mph, governed on the truck by Crown’s Access 123® comprehensive system control. InfoLink® provides Terex Trucks with live visibility on fleet utilisation and uptime while daily operator checks are now completed on the truck and logged into the system. The Crown C-5 comfortably deals with the tough application, with enough torque to cope with the inclines, even when carrying heavy components,while the standard hill-hold feature holds the truck in position without requiring constant pressure on the brake pedal. Drivers in particular love the C-5, commenting on the spacious cabin with easy access while the suspension seat ensures they receive a very smooth and comfortable ride. Driver feedback also highlights the truck as being very stable, remaining smooth and controlled even on rough ground. The driver’s daily check is completed through InfoLink®, with the system alerting a supervisor if it is not done properly, within the correct timescale, ensuring accountability and traceability. Terex Trucks also now has live visibility on fleet utilisation and uptime.